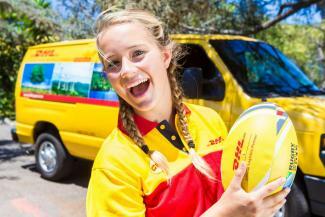 DHL Express, the official logistics partner of Rugby World Cup 2015, worked alongside USA Rugby, the national governing body, to select Haley from among many other nominees as the winner of this life changing opportunity. The DHL Youth Leadership Scrum contest was the first of its kind and was launched to recognize U.S. youth who show exceptional leadership through sports. Parents, coaches, teachers and community leaders from around the U.S. were asked to nominate a child or youth between the ages of eight and 15 who exhibits leadership qualities, promotes the spirit and practice of sport ideals, builds or promotes community values, and has a positive impact on the community. 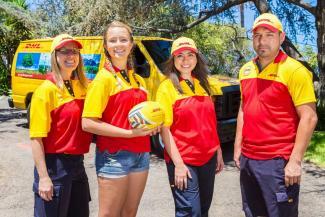 In addition to delivering the official Match Ball to the referee on the field at the USA v South Africa match on October 7, 2015, Haley will receive round trip tickets and accommodations in London for herself and her mother who will be attending with her; tickets to the USA v. South Africa match and a Rugby World Cup 2015 DHL merchandise kit, including a uniform and DHL Rugby ball. Through Rugby and community service, Haley exemplifies hard work, dedication, teamwork and leadership. Her passion for the sport led her to advocate for the creation of a Rugby team at her high school. With perseverance, she overcame the initial deep reluctance of the school administrators to allow the sport, and for two years has worked hard to expand the rugby team into a program that the school has embraced. Additionally, due to the fundraising efforts of Haley and her team, more than 100 kids in her local community now have an active after school, all-inclusive sports activity. Haley’s team works together to ensure that no athlete is ever turned away because of an inability to pay. Rugby is one of the fastest growing sports in the world, played in over 100 countries. Rugby World Cup is the greatest prize in Rugby and one of the world's most admired competitions, having established itself as one of the most important sporting events behind the Olympics and FIFA World Cup. The partnership between DHL and Rugby World Cup 2015 continues a longstanding relationship between DHL and the game of Rugby. As the Official Logistics Partner of Rugby World Cup 2015, DHL will assume responsibility for the logistics for one of the biggest international sporting events, which will take place in host country England over six weeks in September and October 2015. DHL is responsible for the transportation of Tournament and team equipment from around the world to the 13 match venues in England. The equipment to be transported will include an estimated 1,400 balls, 200 kicking tees and 200 tackle bags. Rugby World Cup 2015 will consist of 48 matches played by 20 nations over 44 days. During the Tournament, there will be 920 players and team officials, over 60 citing, judicial and match officials, 6,000 volunteers, 400,000 visitors to the United Kingdom, and an estimated $3.2 billion economic impact.